Greasy food can be problematic if traditional paper bags are used, so this is where your Greaseproof Scotchban alternative fits into your packaging solution. Our 100% recyclable Scotchban (greaseproof) bags are designed to keep mess to a minimum. 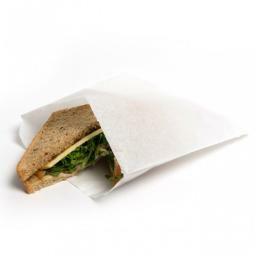 Made from 39gsm greaseproof paper, these bags offer a perfect soloution to greasy or oily foods such as sausage rolls, pies, pasties or breakfast baps; hence they are very popular in bakeries, fast food outlets and cafes.